Look, we wish that we had some real behind the scenes photos from Star Wars: Episode VII like the set of the Millennium Falcon, or a new planet, even some lightsabers or weapons, basically anything from the forthcoming sequel which was recently dated for December 18th, 2015. But unfortunately, it's still early days, and the crew at Disney, Lucasfilm and Bad Robot are still busy getting the script and other details together before production begins next spring. 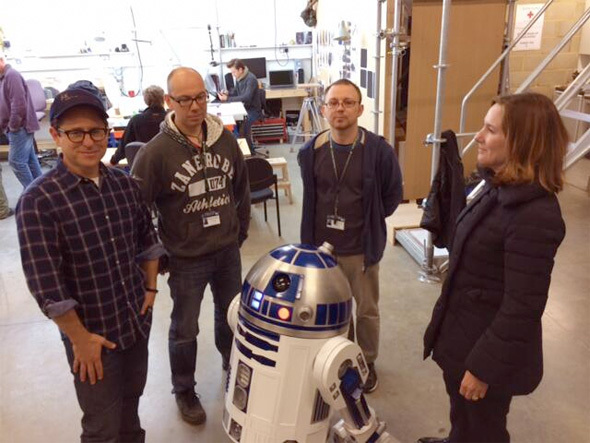 However, we have a photo of Abrams with an iconic Star Wars character as the Bad Robot Twitter feed has just posted a picture of the director with R2-D2. Look! Star Wars: Episode VII will be directed by J.J. Abrams, who is also co-writing the script with Lawrence Kasdan (The Empire Strikes Back, Return of the Jedi), after Michael Arndt was removed from the writing process. Casting is underway with Harrison Ford, Carrie Fisher and Mark Hamill expected to reprise their original trilogy roles in some capacity. In addition, Lucasfilm has assembled an amazing crew that includes director of photography Dan Mindel (Star Trek), special effects supervisor Chris Corbould (Inception), sound designer Brett Burtt (all Star Wars films), and producers Bryan Burk and Kathleen Kennedy. John Williams will bring his iconic score composition skills back for the film arriving on December 18th, 2015. R2-D2 is in it? shocking! Hopefully he'll get killed off in the first scene. Yeah, in almost 40 years they can't come up with any new iconic character designs? Says a lot. in douche bag voice "HEY! SPOILERS!" I bet the whole photo is actually CGI. R2D2 is a Jedi in the new movie...and in following the George Lucas tradition where R2 gets more and more powerful with every movie, he can actually teleport now. I wonder how many fanboys are J'ing their P's over this photo...?